Since 2002 Florida's Eden has worked at the confluence of the economy, environment and education in North Florida. Our vision for the region combines the talent of our people and the preservation of place to produce long term prosperity. To promote the local, sustainable economy, Florida's Eden has produced the acclaimed scenic guides to the Heart of Florida and the Pure Water Wilderness. Both guides are available online at our website www.FloridasEden.org. In our educational program students from Fort White middle and high schools bring together science, writing, arts, and math at the Ichetucknee Springs State Park. Highlights include design of the new gopher tortoise enclosure, building two canoes and filming the first-ever virtual tour for a Florida State Park. This educational model, known as the Ichetucknee Classroom, is being prepared for replication in other schools. 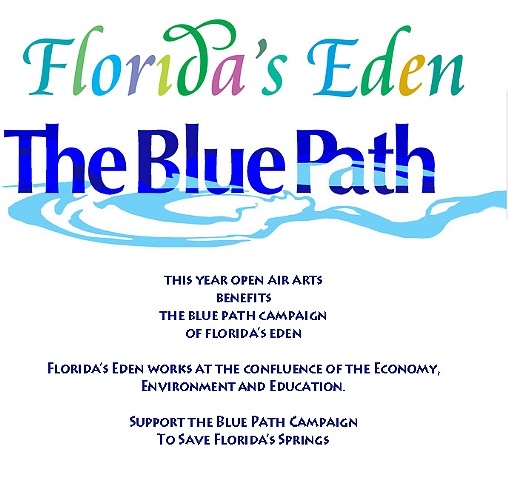 Last summer Florida's Eden opened the very popular Blue Path exhibit at the Florida Museum of Natural History. We are now making plans to expand that exhibit and take it on the road to Floridians everywhere. On The Blue Path Floridians live with water in a new way, valuing it as the finite resource that sustains Florida's environment and economy. On The Blue Path we will save Florida's beloved springs, keep our aquifer and rivers full-flowing and clean, and reap the benefits of a smart new economy. Working in tandem with The Blue Path is the new Howard T. Odum Florida Springs Institute. The Institute monitors springs quality, serves as a clearinghouse for springs resources, and brings people together to advance springs protection.